Houghton Mifflin Harcourt, 9780544303010, 256pp. While certain dishes from Taiwan are immensely popular, like steamed buns and bubble tea, the cuisine still remains relatively unknown in America. 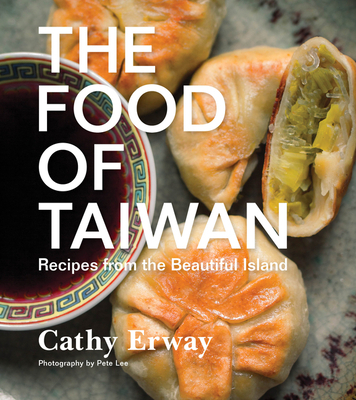 In The Food of Taiwan, Taiwanese-American Cathy Erway, the acclaimed blogger and author of The Art of Eating In, gives readers an insider’s look at Taiwanese cooking with almost 100 recipes for both home-style dishes and street food. Recipes range from the familiar, such as Pork Belly Buns, Three Cup Chicken, and Beef Noodle Soup, to the exotic, like the Stuffed Bitter Melon, Oyster Noodle Soup, and Dried Radish Omelet. Tantalizing food photographs intersperse with beautiful shots of Taiwan’s coasts, mountains, and farms and gritty photos of bustling city scenes, making this book just as enticing to flip through as it is to cook from. CATHY ERWAY is the author of The Art of Eating In and has written for publications such as Saveur, PAPER magazine, and Serious Eats. She is the host of Heritage Radio Network’s "Eat Your Words" and co-founded the supper club The Hapa Kitchen. "In this appetizing collection, Erway (The Art of Eating In), an acclaimed blogger at Not Eating Out in NY, takes readers on a cultural and culinary tour of Taiwan that will engage armchair travelers and foodies alike… From pantry staples such as chili bean sauce, ginger, and rice wine to the vibrant night markets that take over entire streets, she offers an insider’s perspective of the Taiwanese lifestyle and reveals what makes a dish distinctly Taiwanese. In addition to chapters on appetizers, vegetables, meat, and seafood, she explores the lasting culinary influences of military villages, train bento boxes, and Taiwanese tea. Recipes for fried pork chop noodle soup, shredded chicken over rice, and Hakka-style sweet green tea convey cultural insight as well as instruction… Photos of everyday people, the diverse landscape, and alluring dishes complete this engaging and delightful collection."